This is the first in an occasional series of articles inspired by books in my Animal Rights Collection. The archive includes more than 75 books about animals in agriculture. The oldest was published in 1912 and is a pamphlet, “The Slaughter of Animals for Food,” by John Galsworthy, who is more commonly known for his Forsythe Saga series of novels. It is published by the RSPCA and the Council of Justice to Animals. Long before Jonathan Safran Foer’s Eating Animals (2009), Jeffrey Masson’s The Face on Your Plate (2009) (read my review here), Erik Marcus’ Meat Market (2005), Eric Schlosser’s Fast Food Nation (2001), Jeremy Rifkin’s Beyond Beef (1992), Orville Schell’s Modern Meat (1983), Mark Gold’s Assault and Battery (1983) and Jim Mason and Peter Singer’s Animal Factories (1980) to name a few, there was Animal Machines by Ruth Harrison (1964). Nearly 50 years have past since Ruth Harrison's book was published. The impact of Animal Machines can never be over stated. The book had profound impact on the British public and government in that it exposed factory farming for the first time. Its standing in this regard is akin to Upton Sinclair’s The Jungle (1906). The public’s outrage at the shocking depiction of the Chicago stockyards in the novel led to the Meat Inspection Act and the Pure Food and Drug Act of 1906. The latter led to the formation of the Bureau of Chemistry which the Food and Drug Administration in 1930. 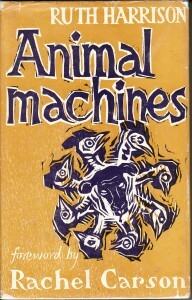 The public outcry from the publication of Animal Machines led to the British government appointing a committee in 1965 to “examine the conditions in which livestock are kept under systems of intensive husbandry and to advise whether standards ought to be set in the interests of welfare, and if so what they should be.” The Brambell Committee subsequently formulated the “Five Freedoms”: An animal should at least have sufficient freedom of movement to be able without difficulty to turn around, groom itself, get up, lie down, stretch its limbs.” This was the beginning of the fight back against factory farming which has led so far to the banning of the battery cage, veal crates, sow stalls and so on. I recall meeting Ruth Harrison when I worked for Compassion In World Faming in the late 1970s. She was a formidable figure. I wished I had known her father was Stephen Winsten, who had written a biography of Henry Salt, Salt and His Circle (1951), which included a preface by Bernard Shaw who knew Salt. Rachel Carson, author of Silent Spring (1962), wrote the foreword to Animal Machines. “I hope it [Animal Machines] will spark a consumers’ revolt of such proportions that this vast new agricultural industry will be forced to mend its ways,” she concluded. Nearly 50 years have past since Ruth Harrison’s book was published. Whereas there is some progress to report, the grip of the trans-national animal agricultural industrial complex has never been as powerful as it is now around the world. I console myself with the belief that factory farming is unsustainable. Much like as we saw with the recent banking crisis intensive animal agricultural interests will also suffer an implosion. Quite simply, there are too many resources being spent to produce too little food.